Papua New Guinea has officially kicked off its APEC year with the first of its 78 meetings underway up until March 9. The First Senior Officials Meeting (SOM1) got underway on a high note at Port Moresby’s Stanley, Laguna, Lamana and Gateway Hotels over the weekend. Officials from the 21 APEC economies are now in serious discussions with an initial 12 meetings. About 2000 officials from the 21 APEC economies will be in Port Moresby for this SOM 1 and will be jetting off to Goroka for their regional visit to experience PNG. Prime Minister Peter O’Neill is away on official engagement over the weekend out of the country with Chief Secretary Isaac Lupari, APEC Chief Executive Officer Christopher Hawkins, APEC Ambassador Ivan Pomaleu, APEC Director General Sir Charles Lepani and all PNG officials engaged, holding forth SOM 1 as officials diligently presented their country’s input. Prime Minister O’Neill in his recent address said Papua New Guinea is very well prepared for this event. “Our APEC will be a truly Pacific APEC, with delegates leaving our country with a better understanding of Papua New Guinea,” he said. 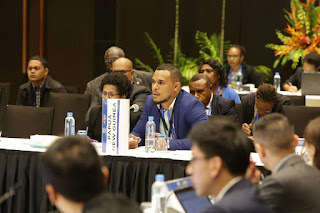 Mr Hawkins said: “APEC has finally arrived and it’s been six years of planning – 2013 to 2018 with all resources now being pulled through for the major meeting. Chief Secretary Lupari said APEC has now landed in our country, it has landed and we are now starting the APEC year. “The officials who will be engaged in providing technical support- for about 70 meetings will be chaired by Papua New Guineans. Ambassador Pomaleu said the policy engagements have begun and we have a total of 78 meetings to run from the 24th of February right up to the 9th of March. “About 23 of those will be chaired, co-chaired or vice chaired by members of our PNG officials team who later will be introduced. “We have 23 of our officials who will be chairing those meetings and that’s an important milestone for our country, it has never been done before. So apart from these chairing, we now have as part of our hosting privileges 23 of our officials to chair and lead discussions with the working committee and something we are obviously proud of.” There will be two more Senior Officials Meeting during the course of the year with the final concluding SOM 4 leading up to the main APEC Leader’s Week and Summit in November.